The metro system in Harbin has earned recognition as the first Metro network to be constructed in the severely cold and high altitude regions of China. Owned by the Harbin Municipal People’s Government, it currently operates on 1 lines, serving 18 stations in total. The metro began operations just three years ago, on the 26th of September 2013. As of now, a small network measuring just 17 km in length, by the year 2018 it is expected to be almost as long as 90 km. By then, instead of operating on just 1 line, it is expected to have a total of 3 lines. Line 1 runs between the Xinjiang Street and East Huagong Road stations over a length of twenty seven kilometers. The construction of this line has been taken up in three phases and upon completion, it will have as many as twenty five stations along the stretch. The stations of Taipingqiao, Tobacco Factory and Museum are planned as interchange points for Lines 3,4 and 2 respectively. The month of September 2013 witnessed the section of the route lying between South Railway Station and East Railway Station being put into service while the rest of the route soon followed suit. The Harbin Metro begins operations at around 06:00 am in the morning and runs till about 21:00 pm, during the winter. Just like most of the metro system in China, the Harbin Metro system also calculates the fares through a distance-based approach. The price range of the fares, like between 2-4 yuan, depending on one’s distance of travel. 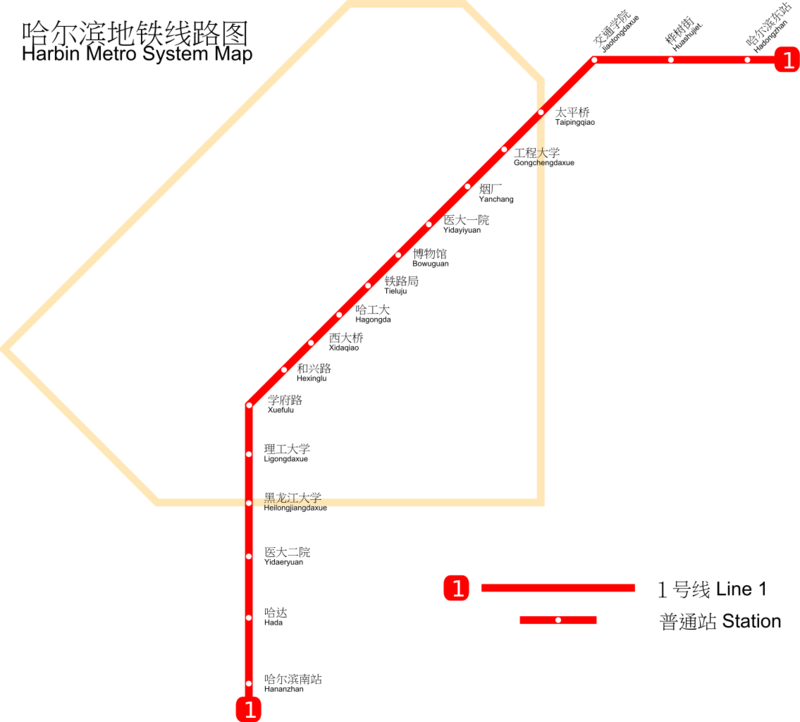 Map of Harbin Metro showing various lines and stations. Click on the map to enlarge it Download Harbin Metro Map in PDF.